Coconuts are a long-time staple of Caribbean cuisine, and practically an emblem of the region’s climate and culture. But a new international initiative is shifting coconut’s image to an icon for business process innovation, wealth generation and sustainable livelihoods. In the last four years, the Caribbean Agricultural Research and Development Institute (CARDI) has been implementing a major regional project, working alongside the International Trade Centre and stakeholders along the coconut value chain to transition the region’s small-scale operations to enterprise-level profitability in the global coconut industry. The European Union and the African, Caribbean and Pacific Secretariat funded the four-year project to the tune of US$27 million. An upcoming celebration called CARDI Day will highlight the Institute’s ongoing work in the EU-ACP funded Regional Coconut Industry Development Project, through a series of exhibitions, public lectures and school tours. Participants will see the many practical ways in which the project is breathing new life into one of the region’s oldest industries. Held on December 5, the celebration will also mark the day in 1974 when Caribbean government representatives met in Georgetown, Guyana to sign an agreement establishing the Institute. Worldwide, a growing demand for fresh coconut produce is being driven by recent trends in the global food and beverage sector and the health and beauty market. It’s hardly surprising that Caribbean farmers are exploring new ways to get more out of the coconut value chain, converting every part of the iconic tree into marketable assets. But it’s not that simple. For many farmers, issues like pests, disease and limited market access are severely constraining their ability to make a sustainable living from coconuts. 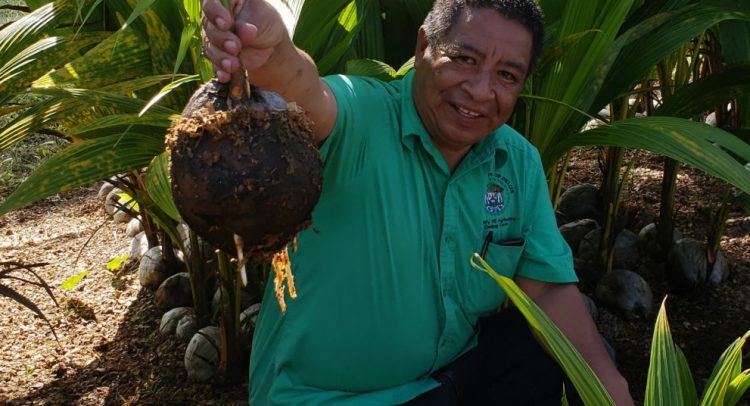 Ricardo Vriesde farms his family’s 500-hectare lot on the coastal district of Coronie, just west of Paramaribo, a region once known as the coconut capital of Suriname. Far from reminiscing on glory days of coconut monoculture, Vriesde is embracing a mixed farming approach. 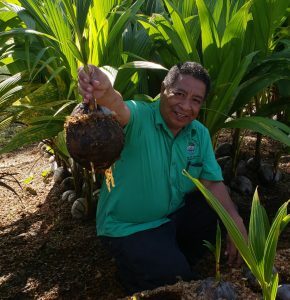 Through the technical advice received under the project, he is replacing ageing coconut trees on his plantation with dwarf and hybrid varieties. And while waiting for the coconuts to come into production, he inter-plants with fruit trees such as cherries, carambolas and bananas to diversity income and regularize cash flow. Vriesde’s not limited to primary production. He plans to scale up his existing bottled coconut water business and has already secured machinery from Thailand to begin producing virgin coconut oil in early 2019. And he’s not alone. CARDI is working alongside local and international agencies in Antigua and Barbuda, Barbados, Belize, Dominica, Dominican Republic, Guyana, Jamaica, St. Lucia, St Vincent and the Grenadines, and Trinidad and Tobago to help other farmers benefit from the window of opportunity created by an upsurge in global demand. In Belize, small-scale coconut processor Dona Dougal Sosa took part in a similar series of training modules to learn how to streamline the manufacturing and packaging processes for her line of coconut-based soaps. In Jamaica, the project has focused on developing farmer’s business skills in order to open up crucial access to financial products and services. A recent collaboration saw the International Trade Centre and the Development Bank of Jamaica providing financial literacy training to several Jamaican producers. Those kinds of interventions are happening across the region’s coconut value chain, bringing together smallholder farmers and small-scale processors with representatives from finance and other sectors so that they can more easily share technical knowledge and market information. Barton Clarke, Executive Director of CARDI, says the multi-stakeholder efforts will add up to a more competitive coconut industry for the entire region. “Through this Regional Coconut Industry Development Project, CARDI is working to improve income and employment opportunities, food security, and overall competitiveness of the Caribbean coconut sector,” Clarke said. “In its first phase, the project has laid a firm foundation from which growth and expansion of the industry can now be accelerated. CARDI will continue to work alongside national stakeholders, regional actors and international agencies to deepen linkages with players from sectors such as health services, manufacturing, finance and tourism,” said Maurice Wilson, regional project coordinator.